Mumbai: Although India has one of the biggest public healthcare networks, spanning large hospitals in metros to village-level primary health centres, the role of private service providers has been gaining importance over the past decade. Poor infrastructure, particularly in rural areas, a shortage of manpower, and inefficient management of resources are making public healthcare increasingly irrelevant, say experts. With the healthcare budget a minuscule 1% of India’s gross domestic product (GDP), even a large increase in government expenditure may not be enough to fill the gaps, they add. 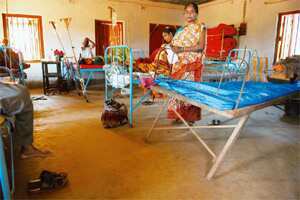 Health check: A primary health centre in Lalgarh. India has nine hospital beds per 10,000 people, compared with the global average of 29 beds and the South-East Asian average of 11 beds, says a WHO report. The country has nine hospital beds per 10,000 people, compared with the global average of 29 beds and the South-East Asian average of 11 beds, according to World Health Statistics 2011, the WHO’s annual report of health-related data for member nations. The country has six physicians per 10,000 people, less than half the global average of 14. The rural-urban healthcare divide is immense. Three-fourths of India’s physicians live in urban areas, catering to one-fourth of the population, said a 2007 report by a task force on medical education prepared for the National Rural Health Mission (NRHM), a government programme to improve healthcare in rural areas. “There is an acute shortage of physical infrastructure in the public health sector," states the report. NRHM, launched in 2005, has managed to bring some improvements in rural healthcare infrastructure. The number of functioning primary health centres has gone up to more than 9,000 from 1,200, the number of community health centres has increased fivefold to more than 4,500, and an additional six million women have had institutional deliveries. But this is at best the beginning of a long journey. The most recent policy recommendations to increase “access and affordability" of healthcare have focused on pharmaceuticals. With a number of foreign drugmakers stepping in, the government has been trying measures to address concerns of an increase in the prices of medicines. The Jan Aushadhi programme was introduced in 2008 to make generic versions of drugs available at subsidized rates. But the programme failed to take off as doctors hesitated to prescribe generic drugs and most drugstores did not have adequate supply. Pharmaceuticals, however, account for only 25% of India’s healthcare sector, according to an IDFC Securities Ltd report. As for the rest: 10% is the diagnostics space and 15% is health insurance and medical equipment. The hospital segment comprises half the healthcare market. The Indian healthcare sector is expected to grow rapidly due to “rising income levels, changing demographics and illness profiles with a shift from chronic to lifestyle diseases", according to consultancy KPMG’s report Emerging Trends in Healthcare, released in February. “This is likely to result in considerable infrastructure challenges and opportunities," the report adds. “The government alone will not be able to cater to the demand," said Murali Rao, associate vice-president (strategy and operations) of Technopak. Advisors Pvt. Ltd, a consultancy that published a report titled Accessible Healthcare: A Reality Check in October 2010 to examine the country’s healthcare scenario. Rao said the role of the government is facilitating rather than providing healthcare. It can do so by investing in schemes such as NRHM or in the form of sops, tax rebates and concessions. “A mix of public and private partnership is needed address the needs, and so the government realizes the role of public-private partnership today," Rao said. Private sectors hospitals, including big corporate hospitals in the organized sector and small- and medium-sized hospitals and nursing homes in the unorganized sector, have already outnumbered the public sector hospitals. Rao said he expects to see more corporate houses entering the market as they realise the huge demand, citing the example of Fortis Healthcare (India) Ltd, which last year announced plans to enter markets in smaller cities.